Michigan Brewers Guild Executive Director Scott Graham welcomes the first of more than 9,000 thirsty revelers to the 2010 Summer Beer Festival in Riverside Park, Ypsilanti. 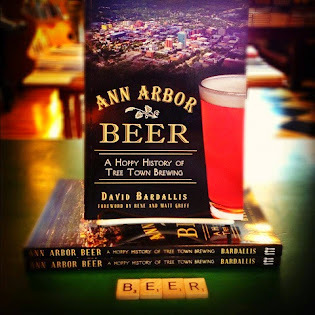 It’s the biggest beer-related event in the whole state of Michigan, and it happens every year right here in our own backyard. 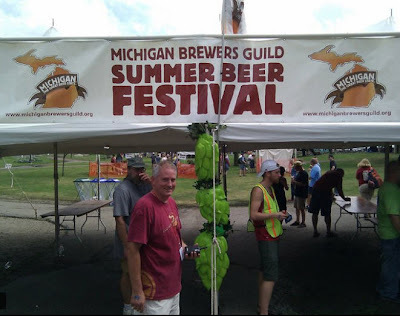 I’m talking, of course, about the Michigan Brewers Guild Summer Beer Festival, the 14th annual edition of which takes place this Friday and Saturday at Riverside Park in Ypsilanti. Tickets are sold out at many, if not most, outlets, and by the time you’re reading this they likely will be gone altogether, so I hope you’ve already got yours. With a record 62 Michigan breweries serving up 450 beers, this year’s festival promises to be the biggest and best ever. Your Week in Beer has more details, after the jump. » The Corner Brewery, 720 Norris, Ypsilanti, is within walking distance of the Summer Beer Festival and is planning events throughout the weekend. From 4-7 p.m., enjoy happy hour brews and meet and talk beer with the brewery staff and from 7-11 p.m., it’s “Firkin Fever,” with several delicious cask beers on tap for you to try. » Beginning at 4 p.m., the newly expanded (now with eight taps!) Wine and Beer Bar at Whole Foods Cranbrook, 990 W. Eisenhower, Ann Arbor, is offering interesting and unique beers to “shoppers” for $3 a glass. If you can’t make it to the Summer Beer Festival, or just don’t like crowds, drop in and have your own mini-fest with beer expert Jimmy and team. » Whether you missed out on Beer Fest tickets or just want to keep the party going, relax in the shade of the Corner Brewery's outdoor beer tent while you enjoy some cold brews, including four specially brewed small-batch beers, and live music from Rootstand and several Halcyon Sundaze DJs. No cover. » Meet some of the people behind the beers at the Festival afterglow party at Wolverine State Brewing Co., 2019 W. Stadium, Ann Arbor, beginning at 7 p.m. and running until 2 a.m. Delicious Wolverine beer will be pouring, natch, and live music and a free pizza buffet (while it lasts) are also part of the fun. And, if you’re in the buying mood, Wolverine logo pint glasses are finally available for purchase. » The Corner never sleeps, so after you’ve slept off your Summer Beer Fest hangover, come back to Ypsilanti at 2 p.m. for Halcyon Sundaze out in the beer garden. Get there early and enjoy a lazy Sunday of specially brewed Halcyon Wheatwine while mellowing out to the stylings of the rotating Halcyon DJ lineup, including yours truly. It’s the best way to unwind before facing another work week. » Did you save your Summer Beer Festival ticket stub? I hope so, because if you show it at the Blue Tractor BBQ & Brewery, 207 E. Washington, today only you can get a growler filled at half price. But a growler of what? On tap now are Smoked Silly Red Ale, a World Beer Championship silver medalist; Hopicidal Maniac IPA, a single malt and hop brew featuring Centennial hops; and, appropriately enough, Lazy Sunday Hefeweizen. Coming soon is a yet-to-be-named Belgian Golden Strong Ale, weighing in at a hefty 8.8% ABV. If you want an idea of how great the Washtenaw-area beer scene is, our nine area breweries together are serving more than 60 of the 450 beers at the Summer Beer Festival, or nearly 14% of the total. For the full list of beers at the Festival, go to mbgmash.org. Or, if you want a printable PDF of the official program to help develop your plan of attack, the excellent website Michigan Microbrews has it here. 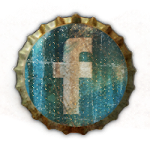 And also read Michigan Microbrews's post on "Social Media and the Summer Beer Festival." Your correspondent, will, of course, be live-tweeting from the Festival on Saturday. 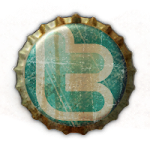 Watch this space for the inevitable Twitter widget. Local beer podcasters the Brew Bubbas will be conducting interviews of Michigan’s most interesting “beer people” all day Saturday as well. For a full breakdown of people and topics, see here.